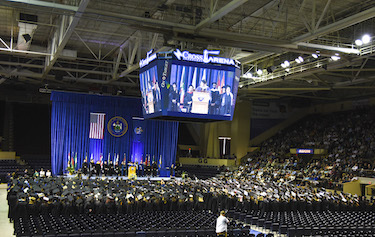 The University of Southern Maine celebrated its 138th Commencement with more than 1,400 students earning degrees amid praise for their hard work and challenges to shape their futures. 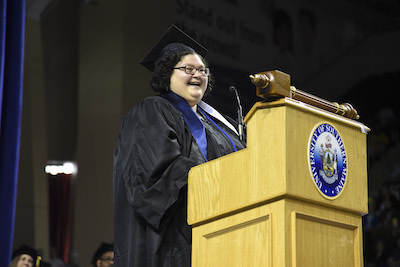 Featured student speaker Lucy Shulman delivered a powerful address about her journey to become an honored Linguistics graduate despite early failure and illness. USM taught her about her own extraordinary worth, she said. "We are significant. And we are worthy," said Shulman. "And in the years I've been at USM, the world has finally seen us. We're not. Invisible. anymore." "Our degrees aren't important because we have them," she said. "They matter because we earned them. Everything we put into them, all the blood, sweat, and tears, and more tears, and a bunch of energy drinks, are what give us our power. " Shulman, a recipient of the highly competitive Japan Exchange and Teaching Program, will be relocating to Japan in July to begin her career as an ESOL educator. The keynote speaker was national civil rights activist and educator DeRay Mckesson. He asked graduates to stand firm in their knowledge -- "We can't let people negotiate history. Some things are just wrong" -- and work toward equity, justice and freedom. "We have to be ok being honest about that there are not two sides to everything," he said. "There aren't two sides to homophobia, xenophobia or transphobia. There is a right and wrong." 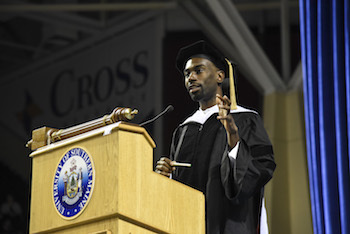 Mckesson, a 2007 graduate of Bowdoin College, has become a passionate advocate for civil rights and justice as a leading voice in Black Lives Matter. In 2015 he was named one of the World's Greatest Leaders by Fortune Magazine, and in 2016, one of the 30 Most Influential People on the Internet by TIME Magazine. Last year, he launched "Pod Save the People," a podcast on culture, social justice and politics. He is now writing a book, On the Other Side of Freedom: The Case for Hope, scheduled for release this fall. "Hope is not magic," he said. Hope is work." He asked graduates to strive to improve their communities rather than only themselves. "Dream big enough to change not only you but the world." Clifton Greim, chair of the USM Board of Visitors, also called on the class to serve their communities. "You are a difference maker," Greim said. "You can help grow our economy and help to shape our future. Your success and influence have no restrictions. Leverage your education and the skills you possess to improve your and our community." Honorary degrees were conferred on Cyrus Hagge '83 & '85, a well-known philanthropist and Portland real estate developer, and Corson "Corky" Ellis, the founder and former Chairman of Kepware Technologies. The event drew coverage from the Portland Press Herald and WGME-TV. There are many great stories to be told from the Class of 2018. Watch a compilation video of several of our featured graduating students, or watch each of the individual graduates — from traditional students and moms to immigrants and the student who spent the last few years as USM's mascot "Champ" — as they share their USM stories in individual videos. Not only have they excelled in their classrooms, but they have also achieved success by engaging in their campus and their surrounding communities. We are also including a video salute by our new graduates, thanking their friends, families and professors.